Wine Maps & Wine Posters. Including Maps of France, Italy, Spain, Australia, Napa, Sonoma, Chile, Argentina and more. These wine maps come rolled and ready for hanging. If you are planning on designing your wine cellar, wine maps and posters can help you create the perfect atmosphere. Chat endlessly about your favorite wine regions. Most of our maps are printed on high quality paper, many of our maps have the option of being printed on canvas - an interesting old world option. Please see more information for each product if the canvas option is available. Made of acid-free matte paper. 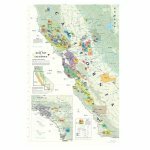 De Long's wine map of California is the perfect gift for any west coast wine connoisseur. 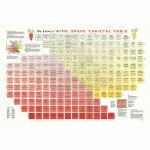 Displays all California wine regions. Map size: approx. 24"w x 36"h.
Explore Bordeaux's ACs and principal communes; overlaid on shaded relief background. Wine Map of Western Europe. Map size: approx. 38" x 26". Map size: approx. 24.5" x 45"
Features prominent wine regions from a generalized, global perspective. Map size: approx. 28 " x 39". Map size: approx. 24" x 40". Map size: approx. 22" x 30". Map size: approx. 24" x 36". Map size: approx. 20 " x 30". For the love of Italian wine, immerse yourself in the land of vineyards - features Tuscany's DOCG and DOC boundaries, as well as informative historical and useful text. We have created an exclusive terroir driven context of elegant shaded relief. Map size: approx. 30" x 38". Map size: approx. 30" x 36". Discover the wine regions of Australia and New Zealand in this detailed one of a kind view of the vineyards in the land down under. Map size: approx. 32" x 36". Map size: approx. 25.5" x 36.5"
From the birthplace of Western civilization explore a new revolution in fine wines. AOCs and regional wine areas are highlighted over beautiful Greek terrain! compelling wines and growing regions. Map size: approx. 22.5" x 32.5"
The beautiful Temecula Valley American Viticultural Area, located in Southern California and known for world class Chardonnays is featured here along with the area's vineyards and wineries. This one-of-a-kind map is printed on high quality satin matte finish. Map size: approx. 28" x 40"
Experience Washington wine country taken to a new level. AVAs and wineries are overlain on this strikingly beautiful VinMap Washington. Map size: approx. 22" x 17 ". Explore South Africa's dynamic topography and wine growing areas.VinMaps South Africa features the Wine of Origin Regions, Districts, Wards, general wine producing areas, as well as some of the country's more notable producers. Map size: approx. 27 x 37 . See one of Washington's premier growing areas in the light of Terroir. Vineyards and wineries are showcased on this magnificent piece of cartographic art. 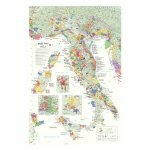 Wine Maps & Wine Posters. Including Maps of France, Italy, Spain, Australia, Napa, Sonoma, Chile, Argentina and more. These wine maps come rolled and ready for hanging. A great addition to your wine cellar, chat endlessly about your favorite wine regions. Get informed about the world of wines on various wine maps. Many produced in Lakewood, WA, Washington, USA, 98134. 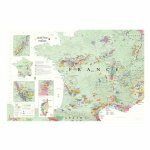 The most popular wine map is for France and the Bordeaux region but we also have a variety of wine maps to cover regions of the United States such as, Oregon, Washington and California. Our maps are widely available for shipping throughout the USA and Canada.